The final installment of the blockbuster motion picture trilogy The Lord of the Rings has been acclaimed the world over as the definitive epic motion picture of recent times. 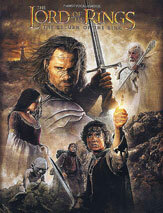 The Return of the King won 11 Oscars and two Golden Globe Awards, for Best Original Song and Best Score from a Motion Picture. This high quality collector's edition contains seven principal movie themes, including the Annie Lenox single “Into the West,” plus, exclusive to this folio is another song performed by Annie Lenox, “Use Well the Days.” Also included are 10 pages of full-color photos from the many incredible scenes in the movie -- all printed on classic antique paper stock.